Look up tonight and you’ll see a big, bright, beautiful spot of light that looks like it would be perfect for taking you to Neverland. DO NOT FOLLOW IT. It is not the “second star to the right.” It’s not even a star. Follow it and you will be killed by a massive radiation belt that surrounds it. Reach it and you will be ripped apart by its intense gravity. And if your spaceship survives all of that (it won’t), you will be obliterated when you reach its liquid metallic hydrogen core. What you are seeing tonight is the planet Jupiter, and tonight it is as close to the Earth as it’s going to get this year. So what is going on up there? Tonight Jupiter is on the opposite side of the Earth as the Sun, or “at opposition.” Because these objects are in a line—Sun, Earth, Jupiter—the disc we see is fully lit by direct sunlight. Conversely, were you to stand on the surface of Jupiter (you can’t because it doesn’t have one), Earth would seem totally black. You might be wondering whether the Earth’s shadow will cause a Jovian eclipse, and the answer is no. Tiny Earth’s shadow could no more blot out Jupiter than a fly could block the bat signal. During opposition this year, Jupiter will be a mere 414 million miles away from us. Everyone be on your best behavior. If you have a telescope, tonight you are in for a treat. If the light pollution in your area is at a minimum, your skies are clear, and if you give your eyes a good 45 minutes or so to adjust to the darkness, when you point your glass at Jupiter and focus, you’re going to see some magical things. First: its beautiful, swirling, colorful bands of clouds. Jupiter is all clouds all the time, and not like Venus—a smudge of basically the same color from pole to pole. Rather, Jupiter is characterized by stark and contrasting parallel bands of clouds. Brown stripes and white stripes and rust stripes and tan stripes. They’re easy, relatively speaking, to discern with a telescope. To be clear: What you will see from your backyard is not going to look like it was taken by Hubble, as the gorgeous portrait above was just a few days ago. When you look through the eyepiece, Jupiter isn’t suddenly going to look like the Moon. You’re going to have to work at this and really set yourself to the task of seeing the details. But once you succeed, you’ll know it immediately. After you’ve experienced the wonder of our place in the cosmos, it’s time to move on to step 2: the Galilean moons, named for the guy who discovered them. Though Jupiter has about 67 known moons, most of them are very small. When Galileo set his telescope to the study of Jupiter in 1610, he noticed three “fixed stars” in a line through that planet. He later noticed that one of them vanished, and later reappeared. He then found a fourth. What he realized he was seeing were moons orbiting a planet, which annihilated the notion that all bodies in space must orbit the Earth. (This did not go over well with the Church, either, though in truth Galileo was obnoxious about the whole thing, and his later house arrest had as much to do with that as anything else.) The moons he saw were Io, Ganymede, Europa, and Callisto. You should be able to see the moons even with a powerful set of binoculars; look for pinpricks in a line through Jupiter, just as Galileo saw. Once you check that box, it’s on to the next challenge: finding the famous Giant Red Spot. You’ll need a more powerful telescope for this, but the secret to finding the Giant Red Spot on Jupiter is to look closely at Jupiter for a giant red spot. How giant is it? Twice-as-large-as-the-Earth giant. The Eeyore in you is probably wondering what you can do if it rains tonight, or if clouds roll in and settle for a spell. Good news! Starting at 4:30 EDT, Slooh will have a Jupiter livestream, during which astronomers will explain what’s going on up there. The livestream will also feature views from remote telescopes, giving you some pretty wondrous images without the trouble of being in nature or forcing your poor, weary pupils to expand and adjust to the unpleasantness of darkness. If all that is still too much for you, here are the images of Jupiter taken by the Galileo spacecraft. 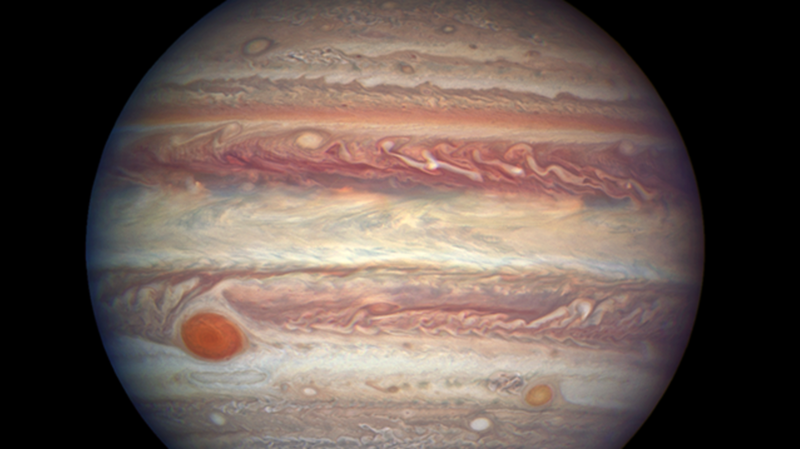 You could also watch this short NASA video about all the footage Hubble has captured over the years of Jupiter and its moons.